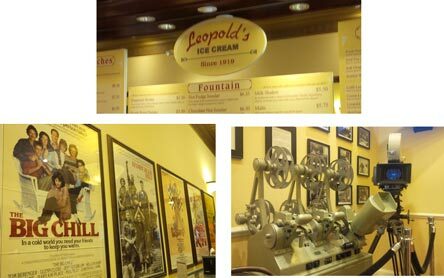 [By Nick] Knowing that we were going to be near Savannah, I knew we had to stop at Leopold's Ice Cream. This shop has been around since 1919 so they have to be doing something right. We got hooked up with 4 cards for free single scoops of ice cream so we made two stops to the shop. On the first trip, we grabbed their ‎Chocolate Chewies & Cream as well as their Mocha Chocolate Chip. I was very intrigued by the former because there was no description and the employee asked me if I was alright with pecans. That's an obvious yes. The flavor tastes a lot like a butter pecan ice cream which is a win for me. The difference here is the chunks of cookies that are throughout the ice cream. They're crunchy chocolate chip cookies which work perfectly with the base. 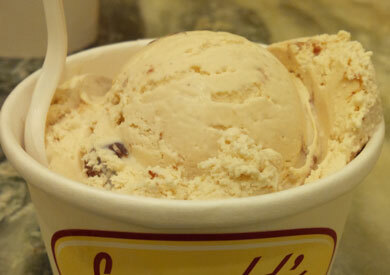 The story behind this flavor is that the Chewies were once made by a famous bakery in town – Gottlieb’s. When the bakery closed the elder Gottlieb came in and taught Stratton Leopold how to make his famed Chewie. Now they make the cookies themselves for the flavor. While they're called chewies, mine weren't all that chewy. That's not a bad thing though. This is a flavor I wouldn't mind having a pint or two hidden away in my freezer. 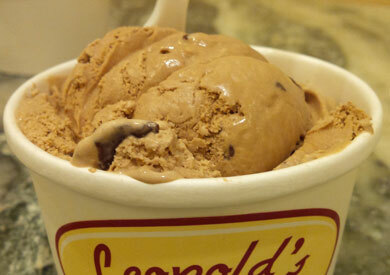 The mocha chocolate chip was my girlfriend's pick because she was craving a coffee flavor. It satisfied her craving and more. It's a robust and bold coffee base with just a bit of chocolate to it. Nothing too much but you can tell it's not just a straight coffee base. The chocolate chips are dark and add to the bitterness of the base in a good way. One of the best coffee flavors I've encountered from a scoop shop as well. We both highly recommend it to any coffee lovers. visit #2 involved us grabbing both of their August flavors. 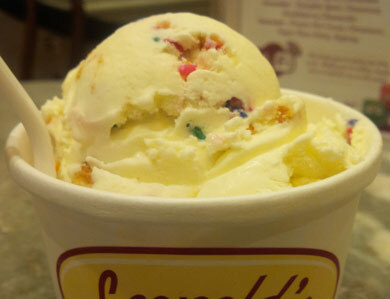 Hands down, their Birthday Cake ice cream is the best I've had. It's more of an adult version in the sense it's not overly sweet. They opted against the frosting swirl which makes most birthday cake flavors far too sweet. My girlfriend, who doesn't enjoy birthday cake flavors, even enjoyed it. There's tons of large chunks of cake that are as fresh as can be. The sprinkles add little flavor as usual but they break up the cake's texture and make it look festive. The base tastes like yellow cake and is very similar in flavor to the mix-ins. This is how birthday cake flavors should be for those not looking for a sugar induced coma. Last up, the unique Huckleberry Cheesecake. Admittedly, I've never had a huckleberry but the internet says they taste like blueberries. ‎The cheesecake base is slightly cheesy like I prefer. Definitely has the cheesecake flavor to is for sure. The huckleberry swirl is thick and jam like. It actually tastes like a mix of blueberries and blackberries which is something I'm all for. This might be the best scoop shop fruit and cheesy flavor I've encountered as well. There's also a graham cracker crumble throughout which adds a change in texture and round out the cheesecake theme. I can see why this flavor finds its way to the menu multiple times as a monthly flavor throughout the year. 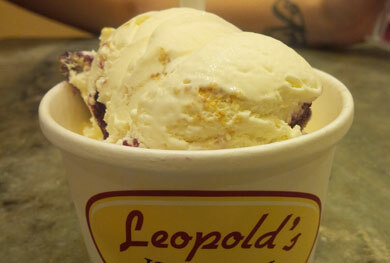 If you're near Savannah and have yet to check out Leopold's, what're you doing with your life? Get down there and get yourself some ice cream! I like the idea of cookies in Butter Pecan ice cream. More mainstream companies should give it a try!